Tomatoe, tomatoe – Didactics, … ? In English the term “didactics” is rarely used. The reason probably is that the word has strong associations with the adjective form “didactic”, which is more often used. And for some reason “didactic” has a very negative ring to it. When something is done in a “didactic” way or didactically it is considered to be moralizing and/or heavily teacher driven in a negative way. Because of this language barrier it has become customary for many continental European researchers within the field of teaching and learning to either use the German word “Didaktik” or simply use Anglo/American terms e.g. “instructional design” when describing their activities. 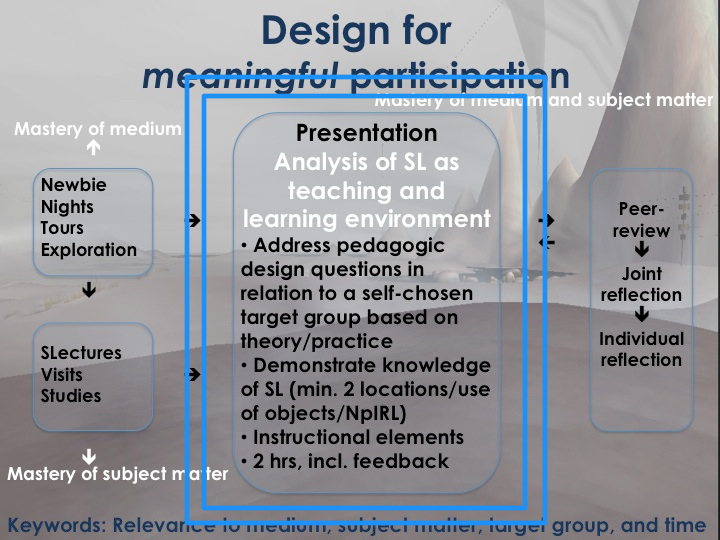 Accordingly, and mainly to avoid misunderstandings because I write my dissertation in English, I have decided to use the more neutral concepts of “pedagogy”, and “design for teaching and learning” when speaking about matters concerning the field and the process of designing. While this is not something I deal with in greater details in my PhD, I actually don’t think this is “just a matter of semantics” – there is a distinction that makes a difference. The way we construct, interpret, clarify, and negotiate meaning – even based on similar words – changes over time, but also within and cross cultures. Turning to the term Didactic, there is absolutely no consensus in the literature regarding the meaning – not even when looking at the origin – the Greek “didaskein”. Even 2.500 years ago, according to Jank & Meyer (2006), the term didaskein could have several meanings; “to teach”, “to be instructed” and “to learn” and the term didaxis refered to both curriculum (primarily as content) and what was learned (outcome). 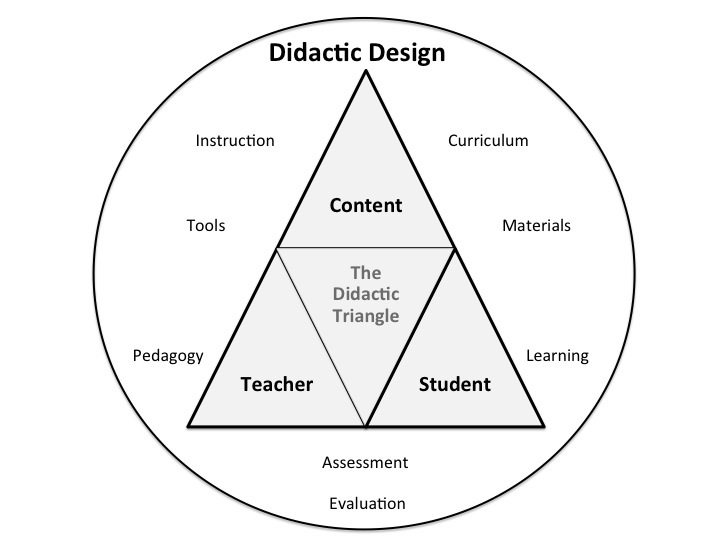 Even though there has been a tendency towards focusing on the teaching aspect of the term Didactic, many Scandinavian researchers refer to the so-called “Didactic Triangle” when trying to explain the basic components of Didactics. What’s really interesting about this framework is the way it highlights the different approaches to the selection of the content/the subject matter, and the way knowledge is created based on different forms of teaching and learning. 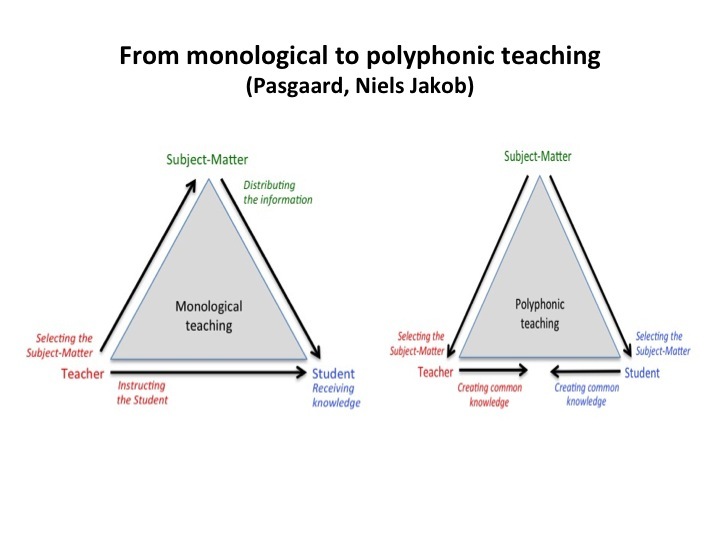 Furthermore, the framework can be used to analyse and thus select appropriate tools for teaching and learning – and Pasgaard offers examples of all three types here. To me, Pasgaard’s framework is an excellent example of how the work of someone coming from a Scandinavian Didactic tradition doesn’t necessarily equal a negative approach to teaching and learning, rather – and as a core principle in Didactics – Pasgaard critically reflects upon our practices and understandings. Just as I have witnessed several Anglo-American “instructional designers” do. Schnack, K. (2000) Er didaktik og curriculum det same? Danmarks Lærerhøjskole. Jank, W & Meyer, H. (2006) Didaktiske modeller. Grundbog i didaktik. Gyldendals Lærerbibliotek. 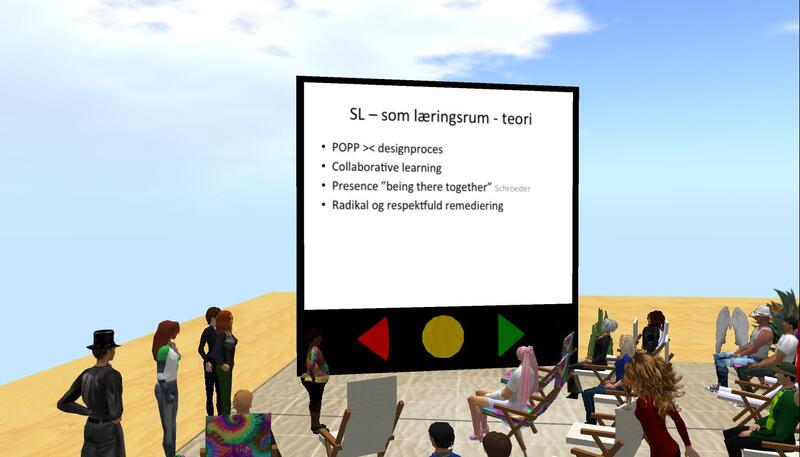 In the PD class, I’ve been running since December 5th, 2011 with students from the Master’s Program on ICT & Learning (MIL) at Aalborg University, the students have to do presentations in-world, and this is the first post of five describing their work. The analysis has to be based on both theory (general course literature combined with literature the students choose for their particular topic), and practice. 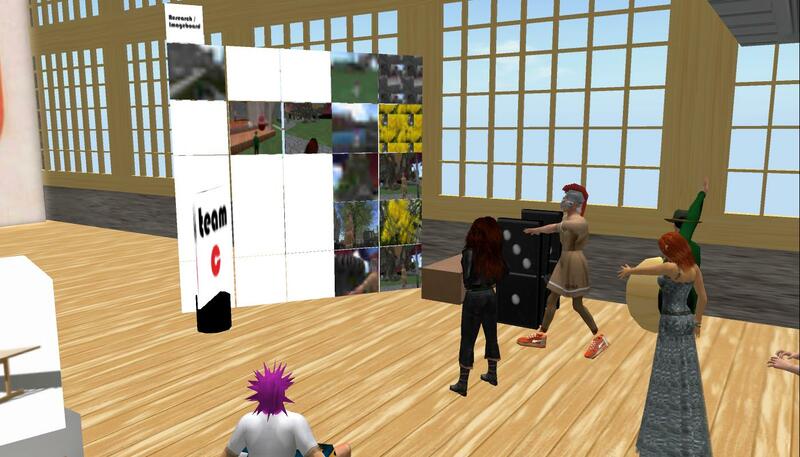 For the latter part, the students have to explore, experiment, and use SL, and they can also draw on the experiences they get from the other course activities in SL. 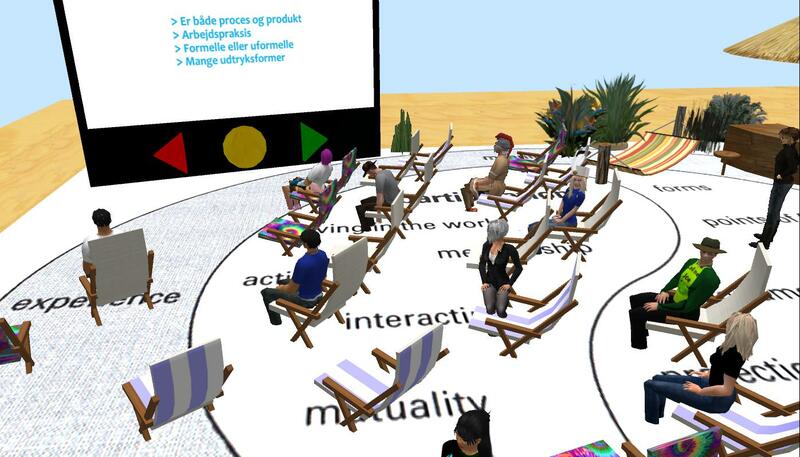 Since all educational programs at Aalborg University are founded on a PBL pedagogy, they students also have to identify and work with RL problems – the students typically choose to focus on problems they encounter in their work settings. In this MIL11 class, the students have been working in 5 teams, and on Wednesday, January 11th the first team A had to present their analysis. Team A: RickDJ, Ingma, MrsJJ, Ilikespace & Merlin – all dressed up in similar clothes to highlight the team affiliation. 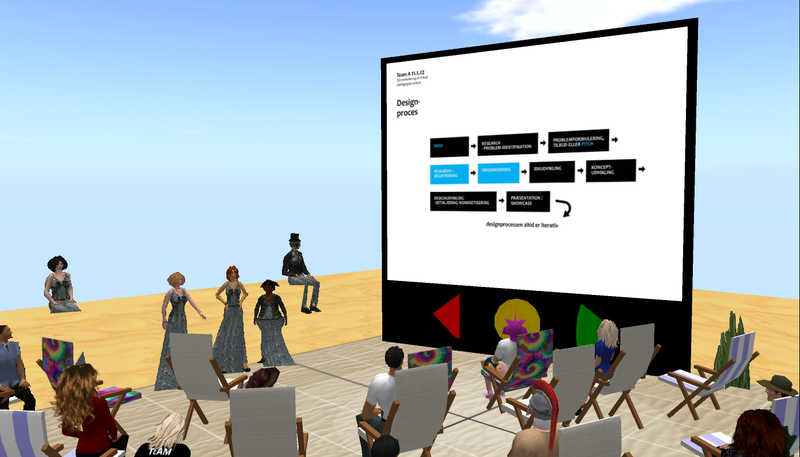 Can SL be used to facilitate a design process in project work? 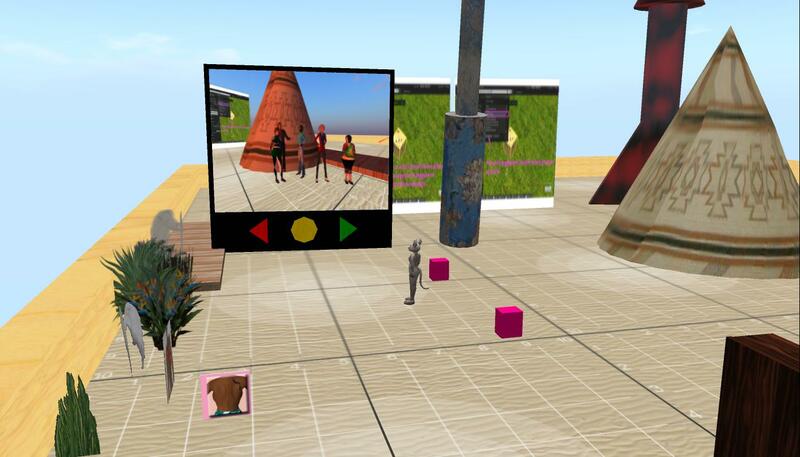 In their work, the team tried to rethink and redesign an existing course for 3rd semester students, and they looked specifically at how SL can be used as a supplement to f2f and other technologies. 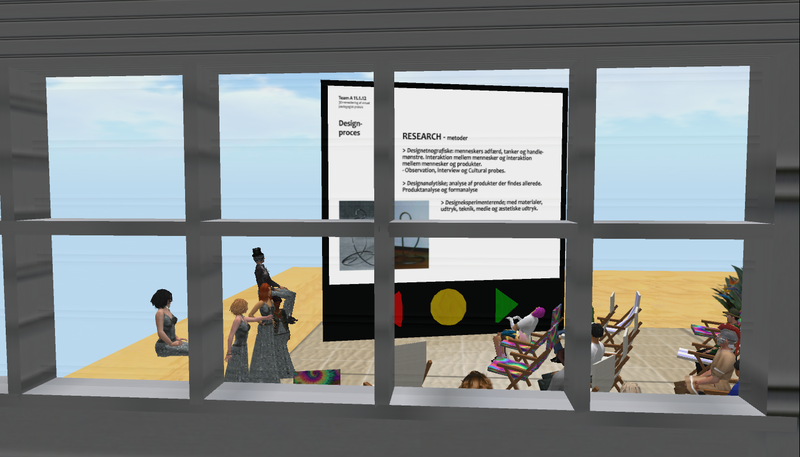 The Team A students were interested in analyzing the particular affordances of SL that could promote certain parts of a design process for students working in groups in a blended environment. 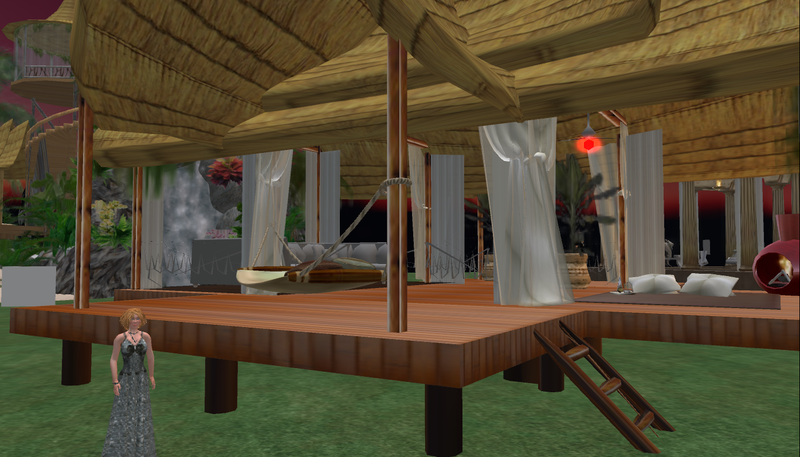 To support the MIL students’ work in SL, each team was assigned a sandbox on December 9th (after they had learned the most basic SL skills), and the pictures below show the progression in team A’s sandbox. 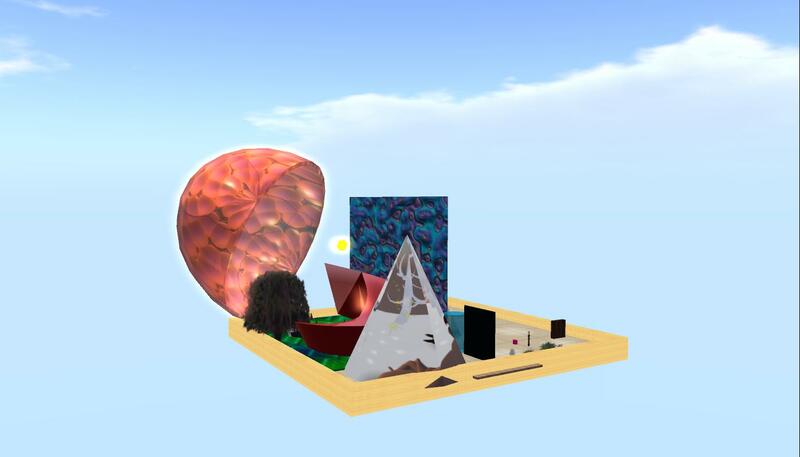 December 17th; the team has begun rezzing and building all sorts of objects. 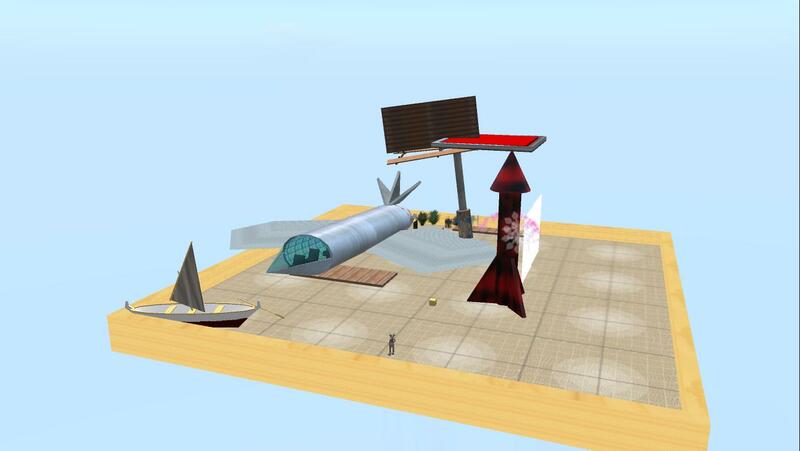 December 19th; the team’s presentation screen is set up for experimentation. 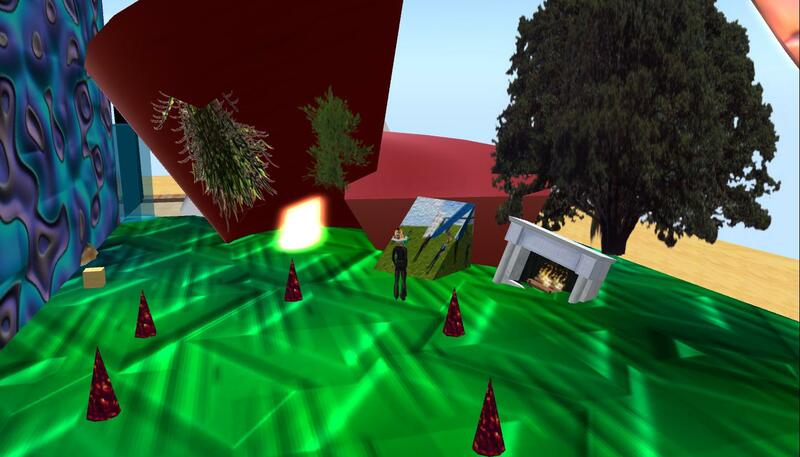 December 21st; One side of the team’s sandbox is filled up with objects creating a radical setting. December 21st; Part of the interior design in the radical setting. 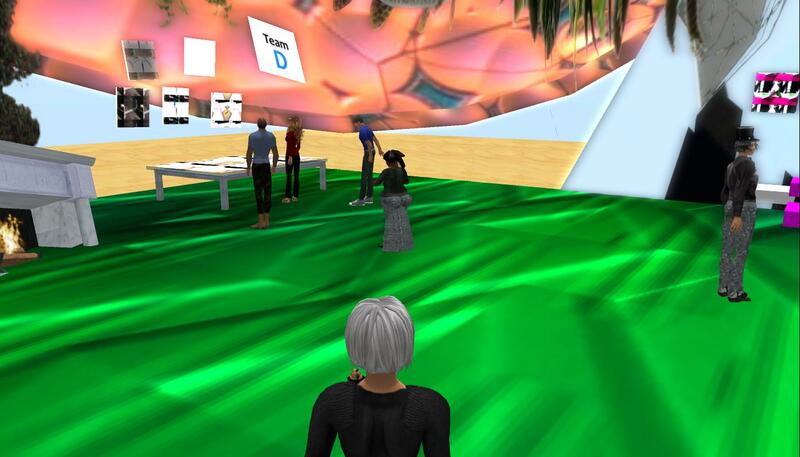 On December 22nd, I had an ad hoc meeting with some of team A’s members discussing the assignment and their design. December 31st; the more respectful setting started to appear in the other side of the team’s sandbox. One January 3rd, all teams were encouraged to present a status on their work, and get some feedback from me, my co-facilitator, Inge and their fellow classmates – and Team A chose to do so. January 3rd; team A presenting some of their theoretical considerations for their upcoming presentation. 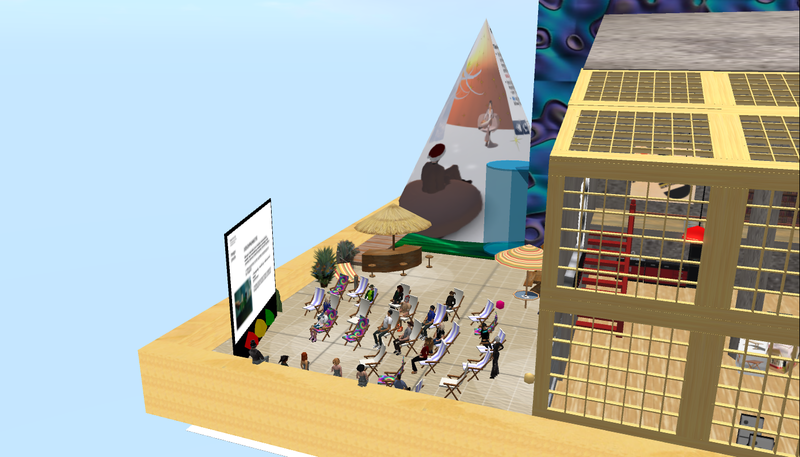 During the introduction, we were given an overview of some of the theories and concepts the team has focused on, and we were given a brief insight into the pedagogical set-up, the students at the e-Design program etc. The team members explained how they saw a close relation between Problem Oriented Project Pedagogy and the design process in general, and they continued explaining how they wanted to illustrate this by giving us small tasks to solve as examples of a typical design process. We had to go to designated locations and take photos for later inspiration. Back in the team’s sandbox, we had to build “a work table for multiple persons”, and present it. An overview of a typical design process with the research and idea generation phases highlighted. The team felt that SL could be particularly useful in some of the more creative phases of a design process, and this was why we were asked to do tasks common to these phases. Because the students are not (due to time constraints) able to try out their hypothesis/ideas on their chosen target groups, it is common in theses presentations to ask the fellow students to act as the target group. 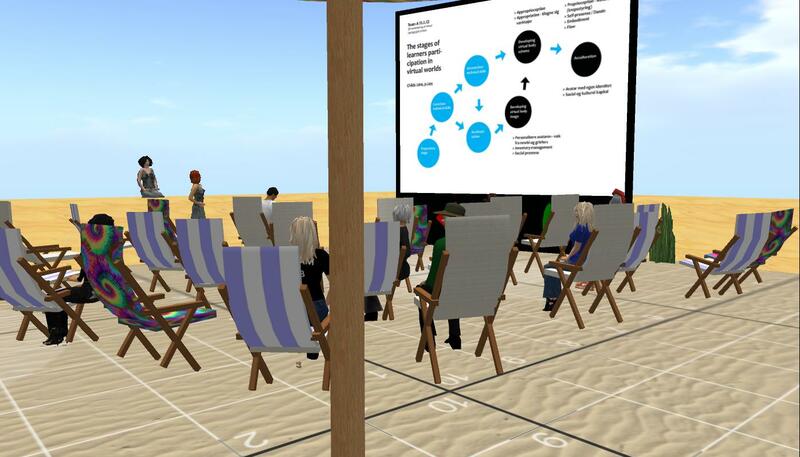 Among the theoretical concepts Team A chose to focus on, remediation and redesign of an existing pedagogical practice, were central – also in the way the team had designed their sandbox. 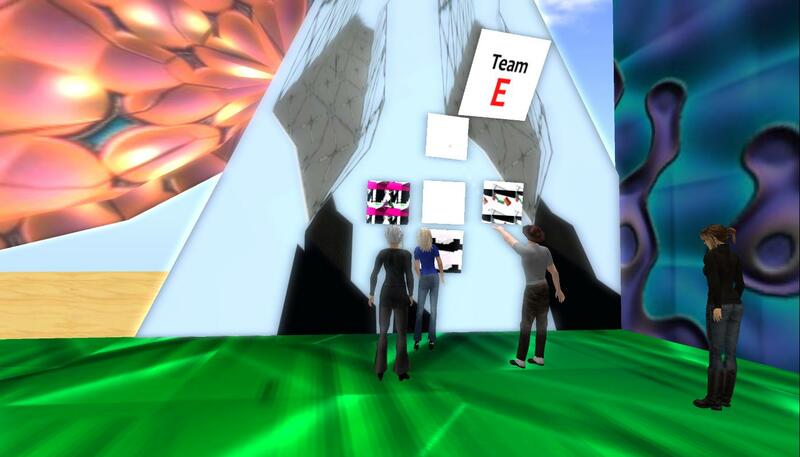 The continuum between respectful and radical remediation permeated both design and activities, and in this way the team managed to visualize what otherwise may seem as quite abstract theoretical ideas. As part of the research phase in a design process it is important to go out into the “real world” and gather information, and Team A had planned four different locations where each of the remaining teams had to go and take pictures for the following phase. 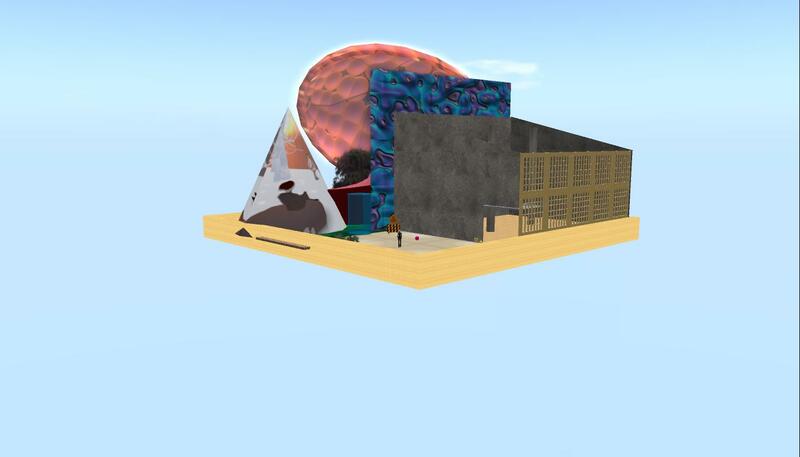 The locations were two respectfully remediated places: Bartlett & Nielsen and Virtual Harlem, and two more radical places: Torley Island and Mysterious Wave . Team A’s Ingma acted as supervisor at Bartlett & Nielsen. Back in Team A’s sandbox the other teams had to put their photos up for display. Team C putting their photos on display. Team D building a table. … and team B building a table. Team E presenting their flexible table, which clearly was inspired by their trip to Torleys. After the presentation of the teams’ photos and tables, Team A continued talking about their theoretical considerations. 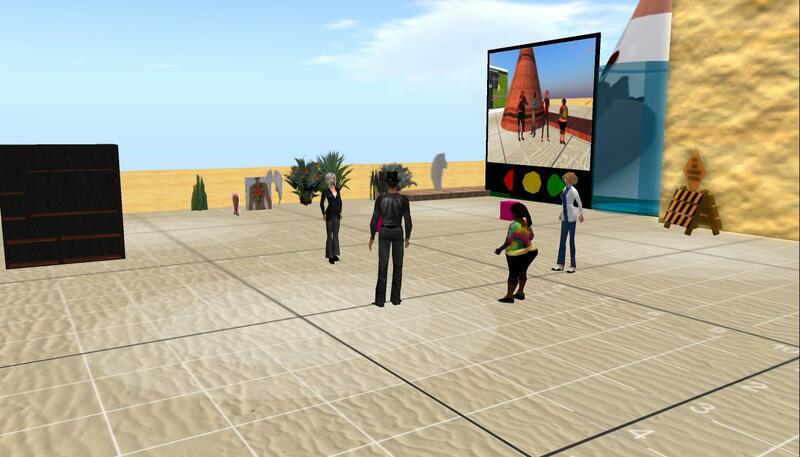 Team A discussing Childs, 2010 model on learners’ participation in virtual worlds. 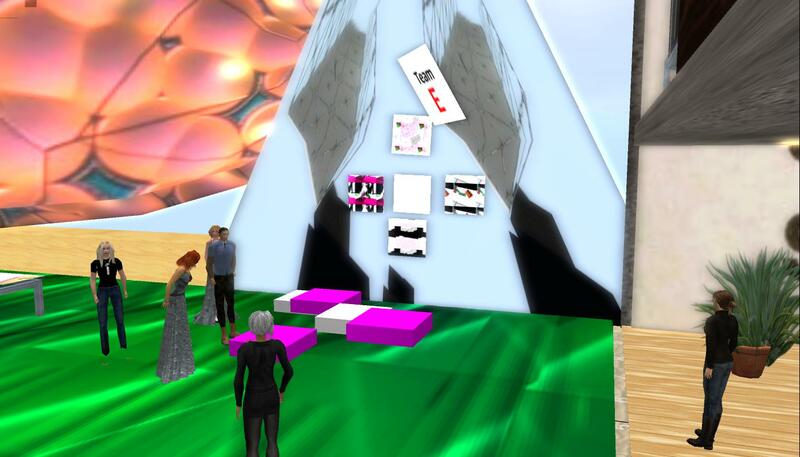 The way Team A had planned their presentation was meant to showcase how SL potentially can be used in social constructivist learning, and even though the activities were limited due to time constraints, I think the team managed to do so. Evidently, in a short presentation like this, it is difficult to get the full experience, but by way of using the exemplary principle, it was my impression that Team A managed to make a very convincing case. During the final part of Team A’s presentation concepts from Wenger’s 1998 social theory of learning were appropriately displayed on the floor.